I have finally found a TRUE gluten-free cereal that still tastes great! We used Erewhon Corn Flakes in this recipe. Attune Foods, the makers of Erewhon, are committed to producing foods that are safe from cross contamination. If you can't get ahold of a box of Erewhon, be advised that Kellogg's Corn Flakes are not considered safe for people who require a gluten-free diet. M kept sneaking the main ingredient! Be careful not to burn the sugar, corn syrup & peanut butter mixture! Use a fork to break up the mixture into small clusters before it cools. 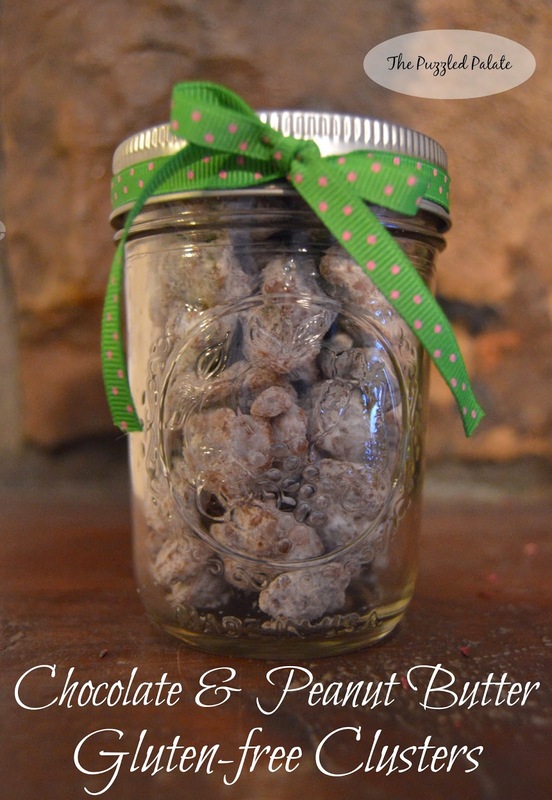 Place the clusters in a bag with powdered sugar. M is always excited to help if the directions include shaking up the ingredients. Such an easy recipe! We hope that you enjoy your GF treats! Attune Foods provided us with a box of Erewhon Corn Flakes for the purpose of this product demo. The recipe and the opinions are my own. ahhh Sugar, Corn Syrup and Peanut Butter? Please pass the spoon!! It looks a lot like "puppy chow" and I'm sure it's awesome! YUMMMMMM! We love snacks like this and I seriously think chocolate and peanut butter were made for each other! Combo works for me... Yum! Having a sweet moment! Yum these look tasty i am going to make these with the kiddies.Thank you for sharing. Great snack...sharing with my friends that are Gluten Free. Mmm, these look delicious. I never thought they'd be so easy to make. 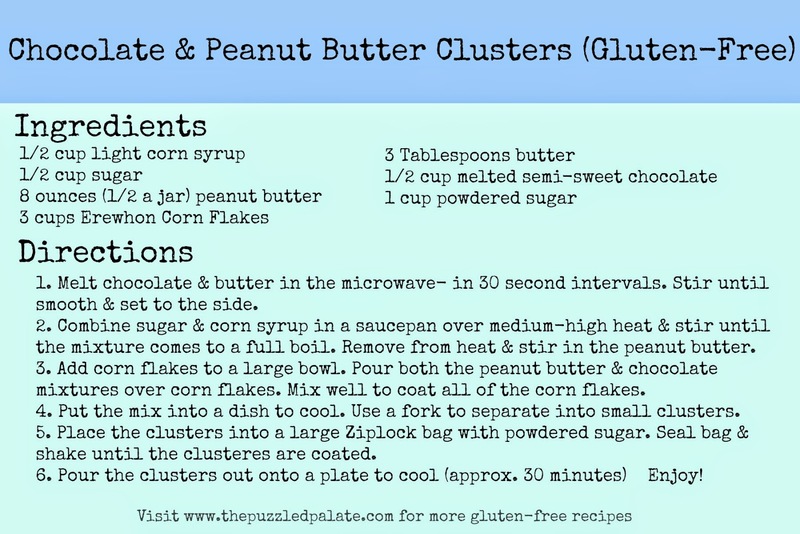 The gluten free chocolate peanut butter clusters would disappear quickly around here. They look delish! Oh this looks so delicious! I will have to make some for my kids. This looks really good. It is a great treat for anyone who needs to eat gluten free products. The shaking would be super fun. No wonder your little helper wants to be involved. Those sound tasty! I have a co-worker who has food sensitivities. I don't see anything on here that she CAN'T have, so I'll have to try this for my colleagues! These sound tasty. I'd probably use the GF Chex...I'm pretty sure they have those. Now, I need chocolate! That looks good! We did a gluten free puppy chow that's sort of like this. YUM! And I love that you got your daughter involved in making the recipe too! Oh yum, this looks like a delicious snack! I need to try to make these too, it looks so easy! We make something similar to this with raw oats and peanut butter with honey and chocolate. These look delicious! I love finding new gluten-free snacks. What a great idea! My kids will gobble these up! I bet that tastes good. I would certainly give it a try....and probably eat the bag lol. Oh wow, I love Erewhon cereal! These sweet looks great! I am going to pin this. It looks absolutely amazing! Thank you so much for sharing. How fun and easy! I love recipes that get the kids in the kitchen with me! Oh yum these sounds great! Love that they're GF! I've not heard of Erewhon cereal before! Looks good though! Thisis a great recipe combining two delicious treats. I would like to make for my kids. This looks absolutely amazing. I love their products and will save this for later. My son is GF and would love this recipe. I would hide these for everyone in the house and keep them for myself! This looks delish! I am just getting into gluten free eating. I would love to start my 'diet' with this recipe! I'm going to have to try this with my little brother. Erewhon Corn Flakes are my favorite, bar none -- and I've been using the crunchy-crumbs at the bottom of the bag for corn bread and cookies for a while. But I've never thought to use them like rice crisps! MMmmmm those look heavenly!! Will have to remember these for xmas time! !